Chicken (White Chicken Meat, Water, Modified Food Starch, Salt, Sodium Phosphate), Low-moisture Part-Skim Mozzarella Cheese ([Pasteurized Part-Skim Milk, Cheese Cultures, Salt & Enzymes] & Powdered Cellulose Added To Prevent Caking, Natamycin [A Natural Mold Inhibitor]), Pizza Sauce (Tomatoes, [Tomato Paste, Water], Salt, Dehydrated Basil and Citric Add), Tomato Paste (Tomatoes), Panko Breadcrumbs (Unbleached Wheat Flour, Sugar, Yeast, Salt), Enriched Unbleached Wheat Flour (Wheat Flour, Malted Barley Flour, Niacin, Reduced Iron, Thiamine Mononitrate, Riboflavin, Folic Acid), Soybean Oil, Dried Egg Whites, Eggs, Water, Pizza Seasoning (Parmesan Cheese [Pasteurized Part Skim Milk, Cheese Culture, Salt, Enzymes], Natural Flavors, Dehydrated Garlic, Salt, Spices, Onion Powder, Sugar and Contains Less than 2% Fully Refined Soybean Oil [Anti-Dusting Agent]), Olive Oil, Sugar, Potato Starch, Modified Food Starch (Waxy Maize), Basil, Sea Salt, Oregano, Dehydrated Garlic. Preheat oven to 375°F. Remove from packaging and transfer onto a baking sheet lined with parchment paper. Bake on middle rack of oven for 15-20 minutes or until golden brown. Remove from oven and let cool for 5-10 minutes; serve warm. We recommend you let these lollipops cool a bit before you eat them, or the sticks may slip off. We weren’t sure what we were going to be in for with these Chicken Parm Pops, but simply put, they were amazing. Just absolutely delicious. 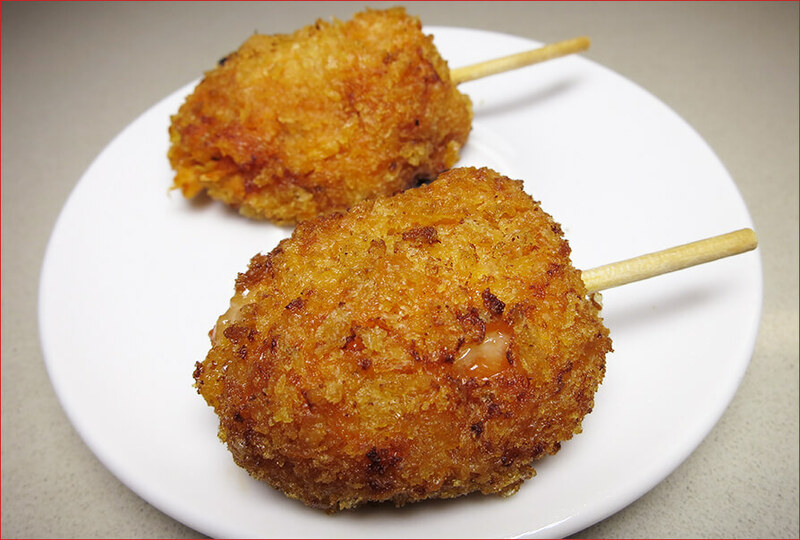 The sauce is really flavorful and tasty, the panko flakes make for a welcome texture and crunch. Plus, the chicken is surprisingly plentiful and well cooked. The lollipop added a fun novelty too – it gave this dish a little something special. We found that these treats they play equally well at a dinner party as they do as a pre-dinner or afternoon snack. We’ll definitely be back for more. 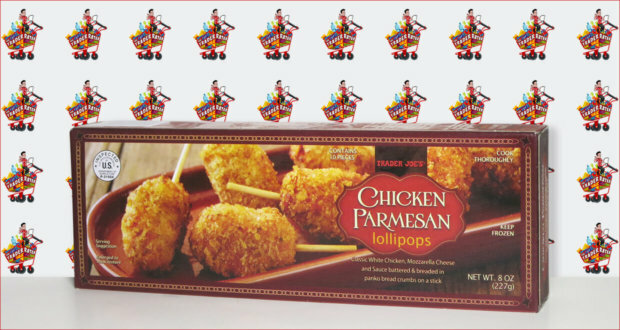 Summary : We thoroughly enjoyed these Chicken Parm Lollipops. They were a surprisingly delicious treat, and we're definitely coming back for more. Well played TJ's!